BASKETBALL SPOTLIGHT NEWS: Zion "The Lion" Harmon Strikes At Nike EYBL! 7th Grader Zion Harmon made a huge statement on the national scene as he tallied 19 points, 6 rebounds and 3 assists to lead We All Can Go All Stars over Team Takeover 68-67 in the Nike EYBL 17U Division. Harmon capped his big day off by making the game winning shot on a follow up. Check out the video below of his game winner. 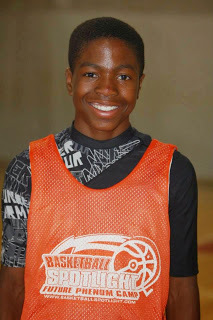 He also made history being the first 7th Grader to play on the Nike EYBL 17U level. Zion’s father Mike Harmon feels blessed about his son’s performance, “I knew Zion could play and has poise but I didn’t know he could turn in a performance like this on this huge stage. We are very blessed but he understands that it’s a long road and he must continue to work hard” he finished. Basketball Spotlight will keep you updated on Harmon’s success as he continues to make history.